He was inspired with western painting when he attended a Cowboy Artist of American Exhibition in the late 1970s at the Phoenix Art Museum. 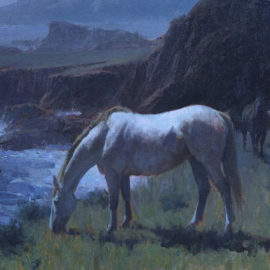 In 1982, he turned to art full time, and visiting ranches in Flagstaff and Prescott, he rode in roundups and learned to work with cattle. 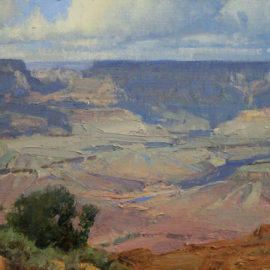 He also developed a love of plein-air painting and was much inspired by the work of Anders Zorn, Edgar Payne and Frank Tenney Johnson. 2018: Express Ranches Great American Cowboy Award, Prix de West Invitational, Nat’l Cowboy and Western Heritage Museum, Oklahoma City, OK.
2017: Spirit of the West Award, Masters of the American West, Autry National Center, Los Angeles, CA. 2016: Frederic Remington Award, Prix de West Invitational, Nat’l Cowboy and Western Heritage Museum, Oklahoma City, OK.
2015: Spirit of the West Award, Masters of the American West, Autry National Center, Los Angeles, CA. 2012: Museum Purchase Award, Masters of the American West, Autry National Center, Los Angeles, CA. 2011: Express Ranches Great American Cowboy Award, Prix de West Invitational, Nat’l Cowboy and Western Heritage Museum, Oklahoma City, OK.
Gene Autry Memorial Award, Masters of the American West, Autry National Center, Los Angeles, CA. Spirit of the West Award, Masters of the American West, Autry National Center, Los Angeles, CA. Bohlin Buckle Award, Masters of the American West, Autry National Center, Los Angeles, CA.